The Town Plan Survey was published online on 8 October 2016, and paper copies distributed to every household on 15 October 2016. The Survey closed on 28 October 2016. This page gives details about how the survey was written, publicised and distributed. A paper copy of the survey can be viewed and downloaded by clicking here. The survey was written by members of the Town Plan Steering Group. To write the questions the group looked at previous survey questions, questions which had been asked in surveys carried out in other towns and also the feedback from the Packhorse Fair. They also looked at research about good ways to ask questions. The questions were a mixture of things which had been asked before (to see if views have changed over time), questions about specific issues (such as parking charges, which were mentioned at the Packhorse Fair), and open-ended questions which allow people to say more about what matters to them in particular. The group tried to avoid asking questions about things about which nothing can be done, and tried to write questions in a positive way (such as asking about how things might be improved for pedestrians and cyclists in the town rather than about controlling speeding motorists). The group thought it quite likely that people of different ages would have different views, and that what matters to people would vary depending on which part of the town people live. When other towns have carried out surveys they found that fewer people in some age groups completed the survey than those in others. For these reasons the group decided to ask for quite a lot of personal information: age, gender and postcode. 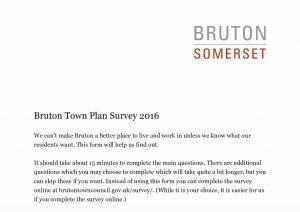 This information was used to ensure that a good cross-section of Brutonians from all parts of the town responded to the survey, and to see whether different groups of people responded in different ways. The survey was written using Google Forms (as the Town Council already subscribes to Google Apps and is able to use Google Forms for free). Six volunteers of varying ages tested the online survey live, their comments being noted as they went through it. Two other volunteers tested the software. Various changes were made following the testing, and once a final online version had been agreed the paper version was designed, written and printed. Information from the paper survey was keyed in to the online survey and then the paper surveys destroyed. The information will be kept securely (in electronic form) and may be used again in future, but only to see whether views have changed over time. The personal information collected in the survey will not be used in any other way, and will not be analysed, published or shared in any way which allows an individual to be identified. If information is passed to a third party for analysis, some of the information will be grouped: the third party will see which age range someone is in rather than their age, and the area of the parish that someone lives in rather than a postcode. Early on in its planning the town plan steering group decided that it was unlikely to have the resources to carry out door-to-door questioning to get surveys completed (the method most likely to gain a high response). Instead the group decided to use strong graphic images and a slogan (“Have Your Say!”) coupled with a publicity campaign to increase awareness and (it was hoped) the number of responses. The survey was promoted by articles in The Dove and the Western Gazette. The online survey went live one week in advance of the paper survey, and its launch was accompanied by distribution of a flyer to all households in the parish, with a simple link to the survey post on the council website (brutontowncouncil.gov.uk/survey/). The flyer invited people to either “Do it Now” online or to wait for their paper survey. The flyer was distributed by local paper-boys working from Church Bridge stores. They were paid at their usual rate. The paper survey was distributed by volunteers on the weekend of 15 October 2016, in an envelope with a bespoke town plan image on it to differentiate the survey from normal mail. One paper survey was distributed per household. Additional surveys were made available at the four collection points for the paper survey, and could be downloaded easily from the council website. The distribution of the flyer and of the survey was supported by posts on the town council website and Facebook page. Take-up of the online survey was lower than expected, and a decision was therefore taken to ask the administrators of the two most prominent local Facebook groups to pin a town plan survey post for the duration of the survey. This increased the response rate dramatically.